With more and more people wanting to get that celebrity smile, Belgian dental clinic - Wellness Kliniek explains why veneers may be just the solution you're looking for to fix your crooked or discolored teeth. The perfect way to achieve a stunning smile! Facings (or veneers or lumineers) are thin porcelain shields that are bonded to the teeth. It is a delicate technique that demands considerable skill and expertise from the cosmetic dentist and dental technician to achieve a beautiful, natural-looking result. A facing is hard to distinguish from a real tooth and feels just like your own tooth or molar. Thin Veneer IPS e.max can be pressed to as thin as 0.3 mm for veneers. If sufficient space is present, IPS e.max can be placed over the existing teeth without the removal of any tooth structure. Depending on the case requirements, however, some teeth may need to be prepared to accommodate for the thickness of the ceramic and to ensure for proper contour and emergence profile. At the Wellness Kliniek we use these latest E-max facings. E-max is beautiful porcelain, which maintains its colour for life and bonds tightly to the teeth. There are two types of facings: composite or porcelain. What is the difference and what are the advantages and disadvantages? At the Wellness Kliniek we always advise you to come over for a personal consultation with our specialist cosmetic dental surgical team so they can tailor a treatment plan specifically suited to your individual needs, budget and in order to achieve the desired result. Even the smallest of changes can make a huge difference! Discoloured, crooked and uneven teeth can all be corrected. 1 composite facing on the front tooth. The result is stunning and looks natural. 8 porcelain facings. Teeth that are too small or cracked can be corrected with porcelain facings. Now with this latest technique in smile enhancement and prices to suit all budgets, there is no excuse not to get the smile you have always wanted or to restore your teeth back to their former glory! Wellness Kliniek in Genk, Belgium is a private cosmetic surgery hospital specialising in cosmetic surgery and dental procedures. 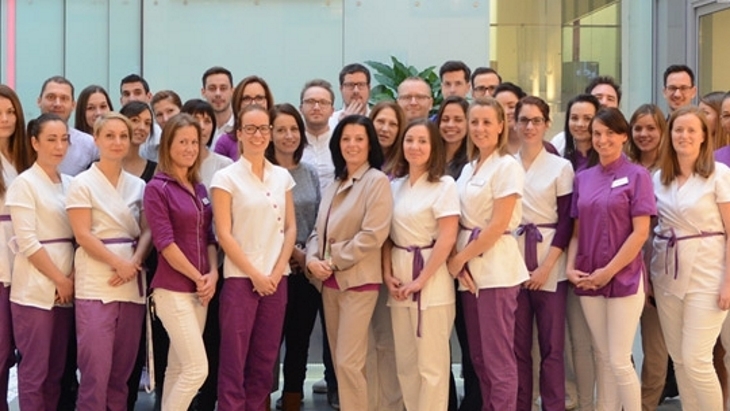 The largest of its kind in the BeNeLux Union, the clinic carries ISO 9001 and ISO 14001 Quality Certification for cosmetic surgery, cosmetic dentistry, hair transplant surgery and weight loss surgery. It also offers genital surgery, preventative and anti-ageing treatments and medical check-ups. The difference between All-on-4 and All-on-8 dental implants. Helvetic Dental Clinics Budapest has been named "Best of Budapest & Hungary" in "Health and Medical Services" category.